Pat Lewis’ Cragmore, the tale of a billionaire’s brush with death and how he avoids ending up in the Devil’s hands. Pat’s art is beautifully polished, and the story unfolds into weird little turns that always surprise me. The whole graphic novel will be available this summer; in the meantime, buy volumes 1-3 from Pat’s online store or read the first 20 pages for free. Man, Bill Roundy’s journal comic The Amazing Adventures of Bill makes me want to live in New York! Or at least visit it more often for drinks. 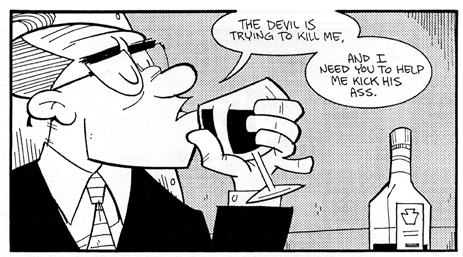 Bill was selling issue #12 of the print minicomic collection of this comic, but you know what? You should plunk down cash and buy his massive paperback book of strips from 2003-2008. It’s worth it for the bonus newsletters included in the back. I’m usually the sourest jerk about 24-hour comics, but Chris Brown’s My Goddamn Upstairs Neighbor made me chuckle, especially the fun way he used the panel borders. Dan Mazur is a local pal from Boston Comics Roundtable, but did you know that he’s also the king of sadness? His latest minicomic The Way it Crumbles is a heartbreaking tale about capitalism, exploitation, innocence lost, and the Keebler elves. The Roundtable’s New England buddies Trees and Hills have been turning out anthologies left and right, and MoCCA saw the debut of their newest, Play. 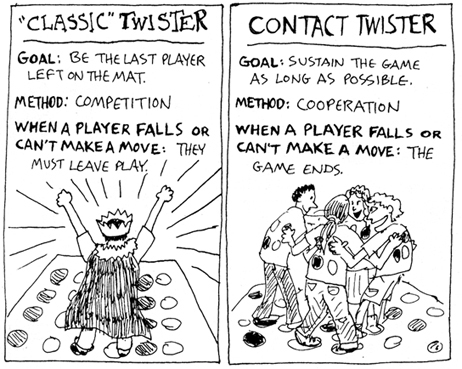 I liked Colin Tedford’s exploration of an alternate version of Twister, which seemed like it would be tee-hee-touchy-feely and actually turned out pretty thought-provoking. Between Being Human and the Kitty Norville series, I’m on a slightly embarrassing werewolf kick lately, so no surprise that I zeroed right in on the Center for Cartoon Studies minicomic anthologies Werewolf! and Werewolf!! (available on the I Know Joe Kimpel site). And what a treat - both of them had hilarious little stories by Betsey Swardlick, who cracked me up a few MoCCA’s ago with her minicomic Poor, Poor Angsty Hungarian. 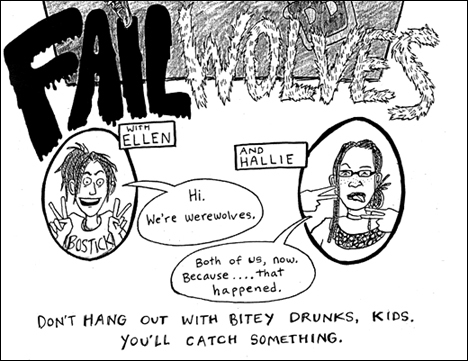 I wanna see more of these two little vegan werewolves! Hope there’s a Werewolf!!! in the works.